The Honda CB125E is a very easy motorcycle for the home mechanic to service due to its simple design and robust nature. The engine will survive well on a steady stream of fresh oil and spark plugs with a few other user servicable items that will require regular attention. As the kilometres slowly clock up on my commuter machine Ive taken the liberty of documenting some of the routine maintenance procedures that the bike needs to remain in good running order and provide reliable service. Some but not all. The Honda owners manual that came with your CB125E includes a Maintenance Schedule somewhere around page 76 that provides a thorough overview of the items that will require servicing and the appropriate intervals. I will not reproduce this table on this site because I do not want to infringe Honda's copyright. I would consider an owners manual to be a handy thing to have anyway, full of useful information ranging from valve clearances to the correct grade of oil to use. Please note that I am talking about an owners manual not a workshop manual, which is a very different and far more technical publication altogether. If you bought your Honda CB125E from new the owners manual may have been given to you by your Honda dealer or alternately it may be found in the document compartment under the seat. If you bought your motorbike secondhand and the previous owner didnt include it or your owners manual simply cant be found dont despair, you can download a PDF version from Honda's Owner Manual Repository. This is an excellent resource by the way, containing owners manuals that date back to the early 1970's and I have spent a few nostalgic afternoons reading the manuals from motorcycles Ive owned in the past. Well worth a look and definetely of great value to the collectors among us. Being able to service your own motorcycle is a handy thing that will save you a lot of money over a long period of time. When I bought my CB125E I considered the options as far as servicing was concerned and felt that paying hundreds of dollars to have the services performed by a professional was simply not warranted. This decision took into account my faith in my own mechanical abilities and the cost of the motorcycle. If I had just bought a more expensive machine (think CBR1000RR for example) I would not have touched it with a spanner at least until the warranty expired. Legislation regarding factory warranties vary from state to state and country to country. If you service your own motorcycle in some locations you will void your Honda warranty. Keep this at the forefront of your mind. If something major went pop on my CB125 I dont know if it would not work out cheaper and easier to simply go out and buy another one. The cost of each service and the distance I travel makes home servicing very attractive. The money I save can go in the bank and contribute towards a replacement should the unthinkable happen. The decision to maintain your own motorcycle is a personal one and I cant tell you if you are capable or not of performing the servicing procedures described on this website or in the owners manual. This is something you must decide for yourself. This website is not a definitive workshop manual and it certainly does not attempt to be. 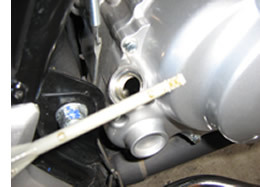 It is intended to be a guide for mechanically minded people, showing them the locations of things such as drain plugs which they may be already familiar with and simply need to know the specifics of these things in regard to this particular motorcycle. It goes without saying that you proceed at your own risk in regard to my advice and tutorials and if you break something as a result dont even consider holding me in any way responsible.